Happy Tuesday. Any fun plans for today? Are you looking for something a little different for lunch? Something for lunch box ideas or picnics? Todays I am sharing this Chicken and Mozzarella Sandwich Loaf recipe. How tasty!? Great to make ahead for a picnic and will definitely stand out from the crowd. Move over limp sarnies, the sandwich loaf has arrived! Cut the top off the loaf approx. ¼ the way down and pull the soft bread out of the centre to make a bowl shape of the crust with a 2cm layer of bread inside. Spread the pesto in a thin layer all over the inside of the bread bowl then layer half of the Cos leaves over the bottom, then add a layer of mozzarella then the roast veg then the chicken. Repeat this till the bread bowl is full. End with a layer of Cos leaves. Replace the lid and tightly wrap the whole thing in cling film and balance a can on top to weigh it down. Leave to firm up for 1-4 hrs. Cut into slices to serve. Note: dry the roast veg and mozzarella on kitchen roll and make sure you don’t use too much pesto to avoid the bread getting too soggy. Recipe and recipe photography by Make More Of Salad. No Payment was received. 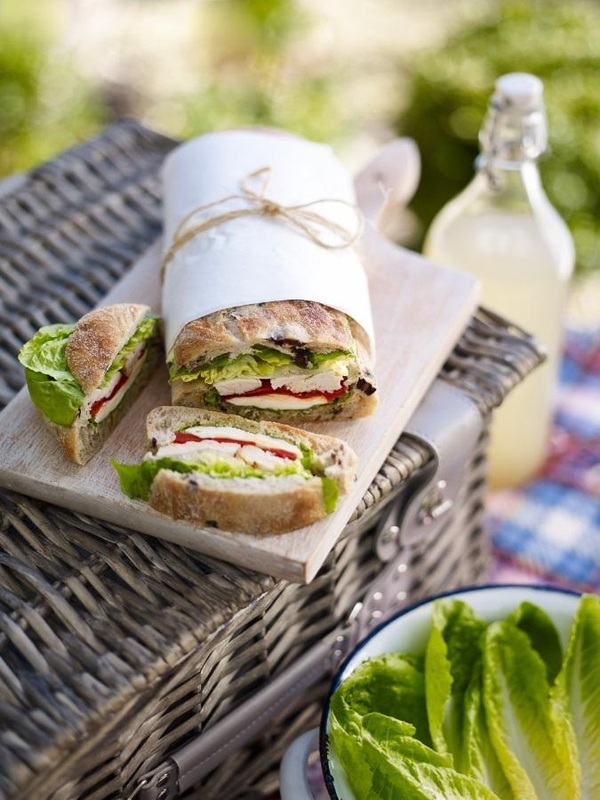 Fancy making this Chicken and Mozzarella Sandwich Loaf? Let me know your thoughts if you get to make this recipe in the comments below. "Spiced Turkey Curry With Spinach, Peas And Cauliflower Rice"
"Summer Gnocchi With Avocado Pesto And Tomatoes…"
I love how it's wrapped in paper! So rustic! Yummy! The photos are stunning. I also like how it's wrapped up in the paper and string! This sandwich looks very interesting and tasty. I will be trying it. Sounds really delicious and I love mozarella just can't eat diary products at the moment. Make more of salad is a great campaign, I am all for salad crammed wrap and sandwiches.